Following on from my previous post on biosimilars and biotherapeutics (or biologics), let’s now take a look at some of the specific criteria for this kind of compound, which are not normally required for “classical” drugs. One of them is immunogenicity. Immunogenicity is the ability of a given product to raise an immune response in an animal or a human. Biological products have this “tendency” to provoke this immune response, so this has to be carefully controlled. For vaccines, we are interested in getting high immunogenicity. For other biotherapies, though, immunogenicity should be as low as possible. There are a number of factors that can influence the development of an immune response by a biotherapeutic, and they can be either product-, patient- or treatment- related, including presence of unusual amino acids or post-translational modifications, protein structure and conformation, level of impurities, immune status of the patient, HLA compatibility, presence of other diseases and/or other medications, route of administration, dosage, etc. (1). All in all, however, mechanisms of immunogenicity and their consequences are still poorly known in some cases, so normally, to study this, several assays are needed. There are several tests available, from in silico study of epitopes that may react with the most common allotypes of HLA present in the population, to more generic tests such as proliferation and cytokine secretion (for cytokine secretion, look out for future post with advice on how to choose the best tool for this, and related to immunogenicity studies). All the available tests & assays render complementary information, and it is not easy to favour one vs. another. 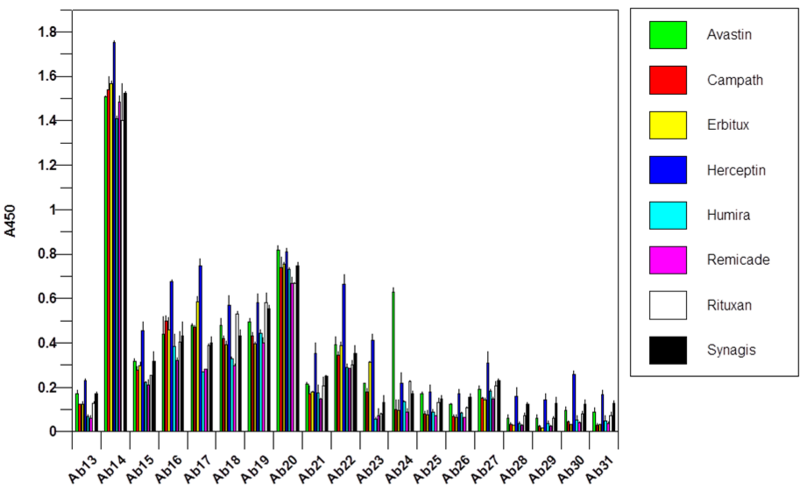 Also, depending on where we are (preclinical vs Phase I, II or III) some assays are preferred over others. In general, the preclinical phase will favour epitope and conformation-related assays, while clinical phases will require study of the specific immune response (e.g. by measuring the ADA – anti-drug antibodies- response). 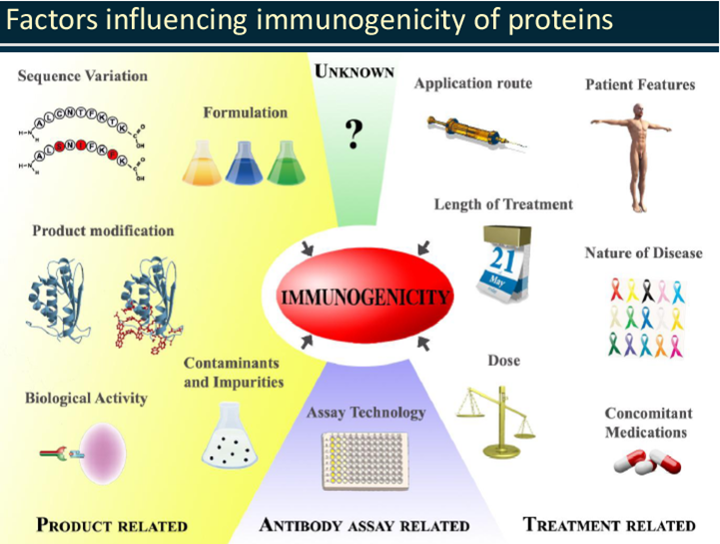 One of the factors influencing immunogenicity is protein conformation, and these studies are usually performed in early preclinical phases, in order to discard the candidates not having the required immunogenicity (2). Therefore, on developing a biotherapy, immunogenicity is a must-do study. For biosimilars, we can either perform a study as we would do with a new biotherapeutic, or we can take a more practical approach. One way to do this in a simple and quick way in preclinical phases is to study the conformation of the biosimilar and compare it with the structure of the reference biotherapeutic. Let’s take monoconlal antibodies (mAbs). When developing a biosimilar mAb, we basically want to compare how it performs with regards to the reference antibody. X-ray is out of the question, too complicated, and also antibodies don’t have a fixed structure, so on doing the X-ray, we would get a blurry structure. Other techniques include near UV CD spectrum, size exclusion chromatography (SEC), analytical ultracentrifugation (AUC), non-denaturing electrophoresis, NMR, hydrogen/deuterium exchange (HDX), bioassays, etc. HDX is widely used, but its limitations include low throughput as well as a very high cost. And remember, we are developing biosimilars, we should keep development costs reasonably low. New technologies have emerged, allowing to study the mAb surface linear epitopes exposure as well as some secondary structure-derived epitope exposure, and the basis is as simple as a sandwich ELISA. This allows to compare the epitope recognition pattern of a biosimilar mAb to that of its reference mAb, in a fast and simple way (4, 5). Basically, the amino acid sequence of the mAb is used to raise antibodies specific against linear epitopes of the mAb sequence (sequences overlap to cover all the mAb sequence). The ELISA wells are coated with this mAb-epitope specific antibodies, so that a pattern for conformational structure is obtained. Comparison of the pattern of the biosimilar with that of the reference mAb is an indication of whether the same 3D structure is kept, and hence, indicates immunogenicity. More studies on immunogenicity may be necessary, but these ELISAs allow a fast screening and are an indication. ELISAs are available for Bevacizumab (Avastin®), Cetuximab (Erbitux®), Alentuzumab (Campath®), Rituximab (Rituxin®), Adalimumab (Humira®), Transtuzumab (Herceptin®), Palivizumab (Synagis®), Infliximab (Remicade®) and Erythropoietin. ELISAs for novel mAbs are also available either as a generic ELISA or as custom-based developments. Interested Biosimilar ” Similarity” Evaluation with ELISAs? Contact tebu-bio’s Antibody experts to learn more. 2.- U.S. Food and Drug Administration. Draft Guidance for Industry: Scientific Considerations in Demonstrating Biosimilarity to a Reference Product. U.S. Department of Health and Human Services Food and Drug Administration Center for Drug Evaluation and Research (CDER) Center for Biologics Evaluation and Research (CBER). 2012. 4.- Wang X , Li Q and Davies M (2013). Development of antibody arrays for monoclonal antibody Higher Order Structure analysis. Front.Pharmacol. 4:103. doi:10.3389/fphar.2013.00103. 5.- Xing Wang, Qing Li, and Michael Davies. BioProcess International 12(6) June 2014.